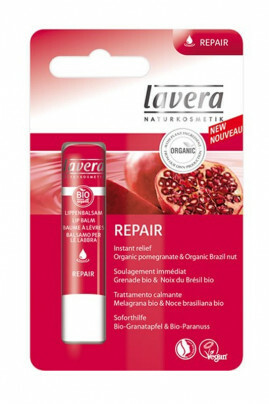 Lavera Organic Repair Repair Lip Balm deeply repairs and protects your lips from dry skin. It brings immediate relief to irritated lips and assaulted by external conditions such as cold. Rich in organic pomegranate and Brazil nut oil with moisturizing and nourishing properties, this vegan lipstick provides comfort and softness to your lips. No more chaps! With Lavera Organic Repair Repair Lip Balm, your lips are naturally soft and moisturized! Lavera Organic Repair Lip Balm offers hydration and protection to your lips! As often as necessary, apply this stick on your lips! Used daily, your lips find their softness! A bio & vegan formula to repair chapped lips!